Given all the problems caused by banks too big to fail, should we just put a cap on bank size and be done with it? Rortybomb says big banks don’t charge lower interest rates, Steve Waldman says big bank size is a proxy for a lot of other problems, and Felix Salmon agrees with all of the above even if it’s true that “there are no good and politically-feasible answers” for putting American banks on a diet. But let’s say this is all true, and that somehow it did become politically feasible to cap bank size. What would be the result? What follows is a little scattered, but maybe some other people who understand the industry better than me can pick it up where I leave off and provide some better analysis. Felix suggests a cap of $300 billion in assets. Fine. But a cap on assets necessarily implies a cap on liabilities, and that means deposits are effectively capped too. Let’s call the deposit cap $200 billion in round numbers. That means the end of nationwide banking since no bank that size can serve the entire country, but maybe you’re OK with that. A small price to pay etc. etc. Even more important, what happens when banks can’t compete with each other by growing? What would they compete on? My guess is that they’d compete on keeping the biggest, most profitable customers and would pretty much lose interest in smaller customers. So small depositors would find themselves increasingly unwelcome, paying higher fees and penalties, having a harder time securing loans, and so forth. After all, what incentive would a capped bank have to treat small depositors decently if they don’t really want them in the first place? Now, it might be that none of this would be a problem. 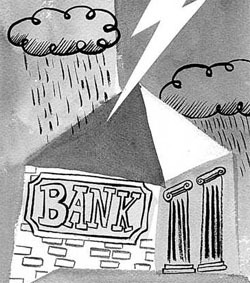 Capped banks would still compete with other capped banks to some extent, and unhappy customers could presumably still leave for smaller banks, who would compete for their business. This is where I’d be interested in hearing from more knowledgeable people. If you game this out, what does the industry end up looking like? A regulated electric company that’s effectively limited by the size of its service area? A monopoly cable company? A bunch of networks of loosely affiliated midsize banks? Or what? Anybody have a good idea?